You are here: Home / Gitamritam: What is it? Gitamritam is a residential Gita camp conducted for youths to learn the Bhagavad Gita in a creative way. It is organized at Amrita Vishwa Vidyapeetham with the blessings of Amma, Satguru Sri Mata Amritanandamayi Devi. If we incorporate Bhagavad Gita’s core values – Love and Compassion – we can achieve peace and happiness in our daily lives. For success in life, understanding and embracing the teachings of the Gita is inevitable. Bhagavad Gita is not just a textbook, nor is it just for old people or for those retired from life; it is also for the young and dynamic who want to achieve and bring a change in their lives. Gita is not life-negating. Rather, it is life-embracing, and its relevance today has grown even greater. The main purpose of the camp is to make the youths aware about the glory of Bhagavad Gita, its message and the necessity of imbibing and practicing its teachings in order to achieve success in life. We teach the Bhagavad Gita in a way which makes it easy to understand the concepts, learn the techniques, experience the wisdom in a practical way, in line with tradition. We help you understand when and where to apply the teachings contained within Gita in your daily lives. By the end of the camp we expect the participants to be able to recite the chapter and explain the meaning of each of its slokas. In each camp, the participants are taught one of chapter’s of the Gita in its entirety. There will also be a series of workshops on how to develop concentration & awareness and on how to be creative. Learn to overcome fear & be adventurous. 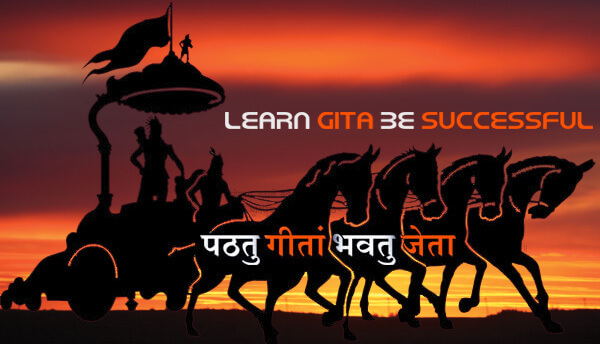 Learn about life skills and how to apply the principles learned from the Gita class. Over the course of these camps the participants are expected to develop a basic understanding about the Gita, its importance and the core values it inculcates. It is our hope that they will incorporate these values into their lives, achieve success and be happy in life. It’s the mystic eye of Sri Krishna. Hence it’s blue. Blue is the symbol of infinity and Love unconditional. Bhagavan is incomprehensible, hence only half of his tilak is here. Tilak is the symbol of our culture, sacrifice and service. Eyes are two, but vision is one. Hence one eye. Vision of Unity which was given to Arjuna by Sri Krishna. Since 2012 we have been running Gitamritam residential camps for various age categories every year. Gita Yatra – visit cultural and spiritual places, learn the history and practices of those places – 1-2 day. (only for those who attended previous Gitamritam camps). Come, join the camp. Let’s celebrate our life! !